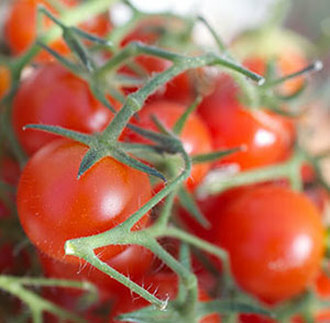 A really easy recipe for plot holders who are harvesting juicy ripe tomatoes this month. At Warriston, most will be grown in green houses, because as well as weather issues (which can be largely overcome by planting hardy varieties) there is a problem with blight (the same disease as affects potatoes, a family relation of the tomato) on many plots. While it's possible to cook tomatoes in myriad ways, it seems a pity to play around with the intense, fresh, warm, sweet flavour of your own home grown specimens. Slice the large-to-medium tomatoes. Cut the cherries in half. Pick the leaves from the herbs and roughly chop, then mix the herbs with the shallots and add black pepper. Choose a large platter and layer the tomatoes, mixing colours and sizes if appropriate. Between each layer, scatter with some of the herb-shallot mix. Cover and chill for a few hours, bringing to room temperature 45 mins before serving. Whisk together the dressing ingredients with some salt, drizzle over the salad and serve.